Purified Water, Sodium Lauryl Glucose Carboxylate, Lauryl Glucoside, Coco Betaine, Coco-Glucoside, Glyceryl Oleate, Sodium Chloride, Sodium Citrate, Phenoxyethanol, Caprylyl Glycol, Sorbic Acid. Cleanses skin and is non-drying, No fragrance or dyes. A little goes a long way. Uses Salicylic Acid instead of BP . Very effective with different degrees of acne.. None. I came across this skin care line last year and my skin had NO PROBLEMS with it. Gentle on skin but effective. 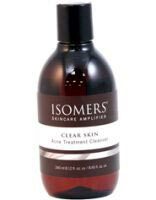 Uses the correct formulation of ingredients to balance skin's pH level while helping to treat acne, pimples and oily skin. Developed by a Cosmetic Chemist who is very educated in skincare.